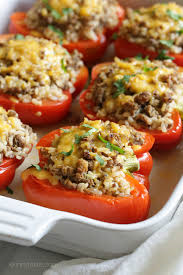 Yummy turkey stuffed peppers filled with ground turkey and brown rice, seasoned with cumin and spices and topped with cheese! This is a favorite. Add 1/4 cup of tomato sauce and 1/2 cup of chicken broth. Mix well and simmer on low for about 5 minutes. Cut the bell peppers in half lengthwise, and remove all seeds. Spoon 2/3 cup meat mixture into each pepper half and place in a 9x13 inch baking dish. Top each with 1 TBSP of cheese.